Launch Silver Lion Slot | Tip-top offers @ Moon Games! 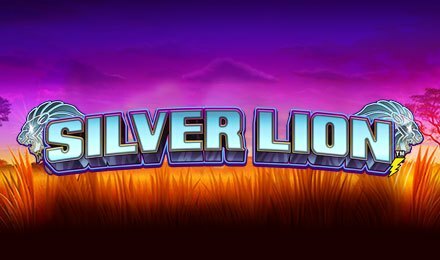 Ride in the African savannah with Silver Lion Slot at Moon Games casino! Crafted by Lightning Box, it is made up of 5 reels and 1024 Win Ways. Seize the opportunity to see meerkats, Masai warriors and even a Silver Lion! All the action takes place in a beautiful setting where you can see a clear sky turning almost purple, along with trees and dry grass. As for the reels, they are framed with sharp spears and contain symbols like the Silver Lion, Diamond, Masai Warrior, Zebra, Meerkat, Hippopotamus, A, K, Q, J, 9 and 10. Start this adventure on any type of device! Ready to place your bets on Silver Lion Slot? Make use of the Up and Down arrows near the Coins icon to adjust your stake. Click on the “Play” icon to spin the reels. With combinations of at least 2 to 5 matching symbols, you can trigger a payout. Don’t miss the Auto Play feature which allows you to play 5, 10, 15, 20, 25, 30, 35, 40, 45, 50, 55, 60, 65, 70, 75, 80, 85, 90, 95 and 100 automatic rounds. Bet Levels: Betting levels are unavailable on Silver Lion Slot. Amount of Paylines Selection: 1024 Win Ways are at your disposal and all of them remain active during your gameplay. Coin Values: The available betting amounts are 0.01, 0.02, 0.03, 0.04, 0.05, 0.10, 0.20, 0.25, 0.50, 1.00, 2.00, 2.50, 5.00 and 7.00. Make the most of the important symbols on Silver Lion Slot! Find the Silver Lion Diamond bonus icon which pays 80, 400 and 800 coins for 3 to 5 of its kind. It also helps to generate the Free Games feature. Land 3, 4 and 5 Diamond bonus icons on the reels to earn 8, 15 and 20 free games, respectively. Every Wild Tree symbol which appears on reels 2, 3 or 4 during the free rounds multiplies any prize by 2x or 3x, going up to 27x! Any 2 Diamonds occurring during the feature trigger 5 extra free games. An alternate set of reels is also used during the round. You must have guessed it by now! The Tree icon stands for Wild on Silver Lion Slot and substitutes for any symbol apart from the Diamond, while appearing only on reels 2, 3 and 4. Since Silver Lion Slot uses 1024 Win Ways, the winning combinations for all symbols apart from Scatter pay in any position on all 5 reels. Coinciding wins are also added. Begin your adventure by launching Silver Lion Slot at Moon Games where an abundance of animal themed games is awaiting you. Good luck to you!